The gunfight that raged between forces and militants in Kundalan village of South Kashmir’s Shopian district concluded with police claimed to have recovered two militant bodies from the site. Director General of Police (DGP), Shesh Pal Vaid said that the encounter in Shopian concluded, saying that two dead bodies have been recovered. He further stated that the slain militants were reportedly affiliated with Jaish-e-Muhammad (JeM). 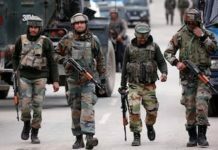 “Encounter at Kundalan Shopian concluded, 2 dead bodies of terrorists recovered.